In 2017, she published “VISUAL THOUGHTS or Stepping through Life One Painting at a Time;” the book has been given to the rare book collections of over 60 libraries. SAN FRANCISCO, CA, October 05, 2018 — Marquis Who's Who, the world's premier publisher of biographical profiles, is proud to present Gloria Allen with the Albert Nelson Marquis Lifetime Achievement Award. An accomplished listee, Ms. Allen celebrates many years' experience in her professional network, and has been noted for achievements, leadership qualities, and the credentials and successes she has accrued in her field. As in all Marquis Who's Who biographical volumes, individuals profiled are selected on the basis of current reference value. Factors such as position, noteworthy accomplishments, visibility, and prominence in a field are all taken into account during the selection process. Throughout her career, Ms. Allen has spent a great deal of time as a broker associate in San Francisco, CA, including at Ritchie and Ritchie in 1992, Evans Pacific Realtor from 1993 to 1994, Frank Howard Allen Realtors from 1994 to 1997, and Fred Sands City Properties from 1997 to 2001. More recently, she was a broker associate at Coldwell Banker from 2001 to 2002 and at Merchant Real Estate, Inc., from 2003 to 2006. Ms. Allen's professional career began as an elementary school teacher in East Rutherford, NJ, in 1963. From there, she took a four year position as a social worker at the Bureau of Child Welfare in New York, NY. Following this, she was a social worker for ten years in the Department of Social Services in the City and County of San Francisco. From there, she worked as a property manager in San Francisco from 1981 to 1991. Ms. Allen considers the highlight of her career to be completing her artists' book because it is a combination of music and visual art that serves as catharsis. She is constantly in pursuit of the meaning of life and this was a way for her to contemplate that. 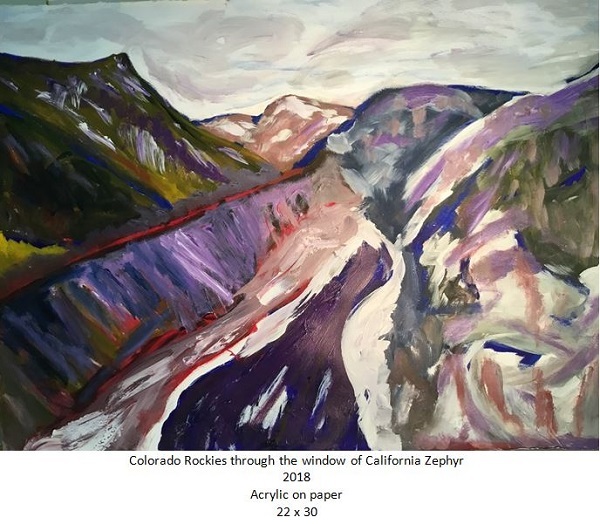 In 2017, she published “VISUAL THOUGHTS or Stepping through Life One Painting at a Time.” The book has been given to the rare book collections of over 60 libraries, including those at Brown University, Columbia University, Cornell University, Harvard University, Northwestern University and the University of Southern California. Before this, she was able to participate in group shows, in which her work was exhibited at Fort Mason Coffee Gallery in San Francisco from 2013 to 2014. Ms. Allen earned an MA from Johns Hopkins University in Baltimore, MD in 1962. She then went to New York City and studied acting at the Circle in the Square from 1963 to 1964. From there, she attended Golden Gate University where she graduated with a Master of Business Administration in 1986. Ultimately, she attended the City College of San Francisco in 2004. She is also a former licensed real estate broker in California. Her passion for painting was something she did not have the freedom to pursue for a long time. Supporting her family and raising her daughters, Ms. Allen lacked the time to devote to art. She became involved with real estate in order to earn money so that she could later dedicate herself to being creative with her artwork and writing. Though art is her passion, Ms. Allen was tremendously involved in real estate as well. She was a member of the National Association of Realtors and the National Network of Commercial Real Estate Women, where she was chief financial officer from 1987 to 1989, and co-chair of facilities for the National Convention in 1993. She was a member of the finance committee at St. Mary's Cathedral in San Francisco from 1993 to 1994. Ms. Allen was previously featured in Who's Who in Finance and Industry, Who's Who in America, Who's Who in the World and Who's Who of American Women. Gloria was born in Paterson, NJ on May 1, 1940 and grew up in Stafford Springs, CT where she was the editor of her 1958 senior high school yearbook. She developed the theme of quotes and photographs to highlight student activities. She has been a swimmer with the US Masters Swim Team at the University of San Francisco since 2007. In recognition of outstanding contributions to her profession and the Marquis Who's Who community, Gloria Allen has been featured on the Albert Nelson Marquis Lifetime Achievement website. Please visit https://wwlifetimeachievement.com/2018/09/10/gloria-allen/ for more information about this honor.